Extremely versatile coaching tool. Can be used to make hurdles with Coaching Sticks, Small Disc Cones, Jumbo Disc Cones and Training Opponent Mannequin Bases (not included). Quick & easy setup. Made of high-impact plastic to hold up to repeated use. Includes 3 yellow connection poles and 6 swivel clips (for pole attachment). Dimensions: 60" H x 1". Lifetime Guarantee. Our Kwik Goal 60" Coaching Stick Hurdles lets you develop the foot speed and agility to get you there ahead of the competition. 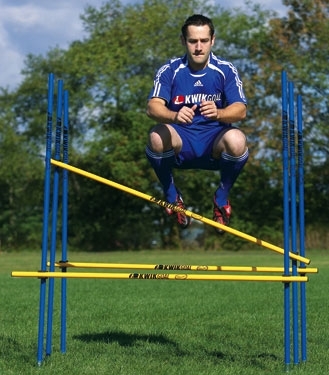 The Kwik Goal Coaching Stick Hurdle Set is a great accessory on the pitch and can be set up to use in a variety of drills.